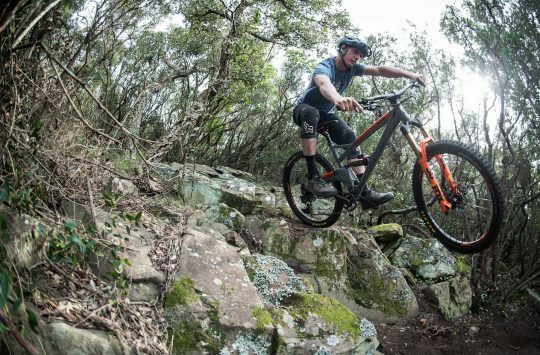 A brand new 27.5+ trail bike from Intense, the ACV+ has 150mm travel at the front, and 130mm (adjustable to 115mm) at the rear. 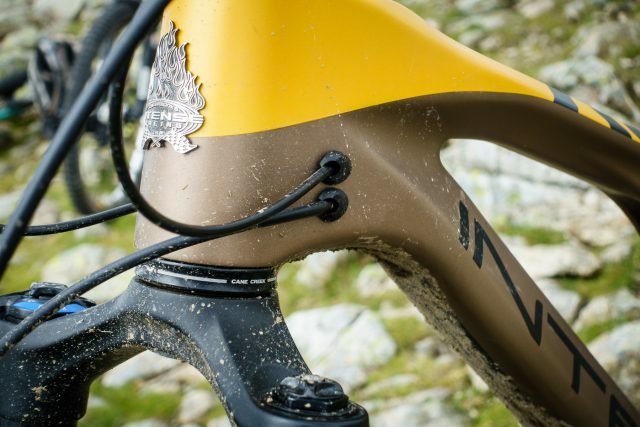 It is available in two flavours – the Pro build that we see here, and the slightly cheaper Foundation build, that both feature the same matte gold and brown carbon frame with Jeff Steber tuned twin link suspension system, dropped top tube for a low standover height, internal cable routing and built in downtube guard to protect against rock strikes. You’ll also be pleased to know (if you care about such things) that there’s room for a bottle cage in a sensible place, not tucked away out of reach under the downtube. The geometry isn’t extreme by modern standards – the wheelbase is long but not crazily so (1199mm). 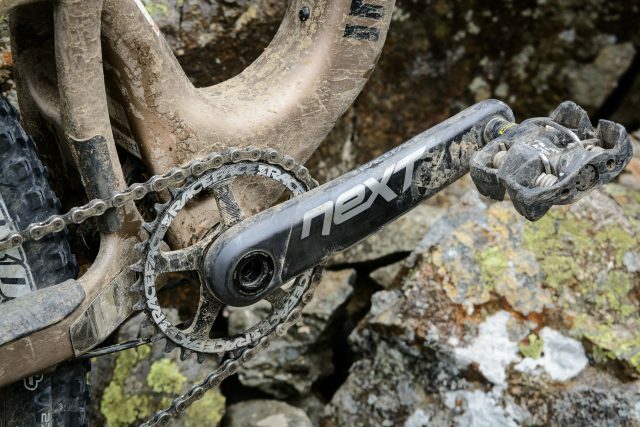 The reach is on the shorter side (438mm), and short chainstays for a plus bike (438mm) mean that both models come as standard with 1×11 drivetrains as there is no provision for a front mech, and unlike some other plus size bikes, this one is aimed at 27.5+ wheels, though Intense has quietly said that running 29er Boost wheels in it is fine. The head angle is 66.25° and the seat angle is 73.8° (effective) with 27.5+ tyres fitted. 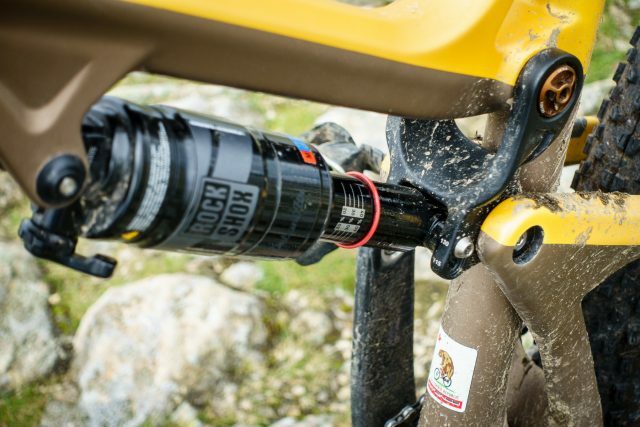 Suspension on both models is provided by Rockshox, and on the Pro, we get a Monarch RT3 propping up the back. 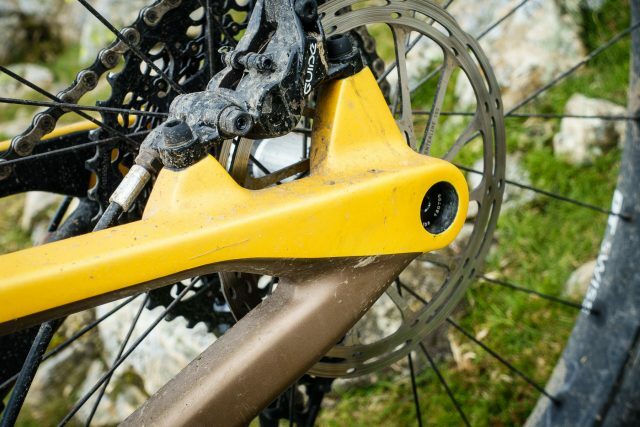 Don’t expect to push the O-ring off the end, though, as the shock’s stroke is shorter than the shock stanchion. The sag markings are correct though and the shock lets you have all 130mm of rear travel (or 115mm if you want to run it shorter). 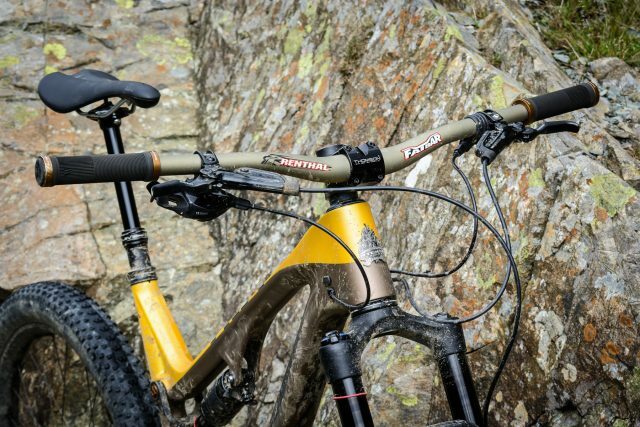 Up front we find the ubiquitous Rockshox Pike RCT3, with 140mm travel and boosted dropouts. 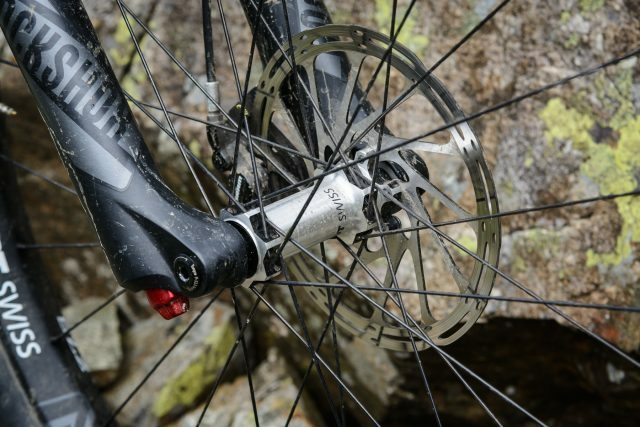 Regardless of your opinion on the introduction of yet more standards, the boost dropouts and bolt through axles front and rear are fantastically stiff, (although the decision to spec a 5mm hex key at the front and a 6mm hex key at the rear is baffling and frustrating). DT Swiss provides the wheels, with their excellent 240 hubs and 40mm wide M1600 Spline2 rims mated together with 28 spokes front and rear. These came setup tubeless ready with the fast rolling Maxxis Ikon 2.8in tyres, although production bikes will have the more aggressive Rekons front and rear that will go some way to alleviate the handling issues I encountered (more of that later). The SRAM drivetrain (a combination of X01 & X1) was flawless, didn’t drop the chain once, and shifted perfectly throughout the test. 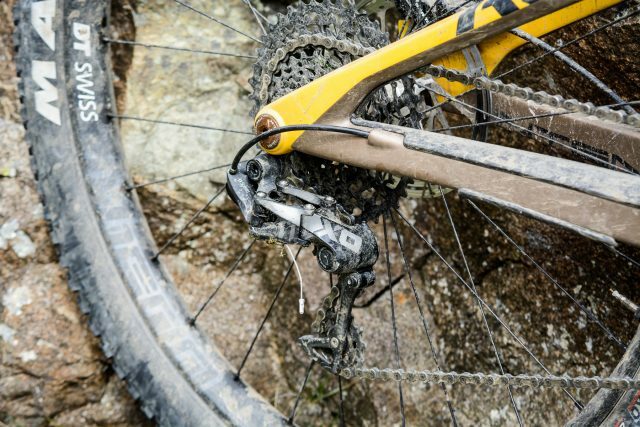 The Raceface NEXT carbon cranks come with a spiderless 32T ring and as I mentioned earlier, in order to get maximum tire clearance, there is no provision for a front mech. Because of this and to aid the exceptional climbing ability of the bike, I’d be tempted to drop to a 30t chainring at the front. Unfortunately, as with other SRAM brakes I’ve ridden, the Guide RS’s howled like a banshee at times, but that didn’t prevent them from stopping me effortlessly at all times, and while they may lack the tool free reach adjust of the more expensive RSC’s, it wasn’t missed at all. A proven cockpit from Renthal, Thomson and SRAM. The KS Lev on the other hand proved troublesome and sometimes needed a helping hand to return to full extension. I tried playing with the cable tension and checked everything was as it should be, but it was to no avail. 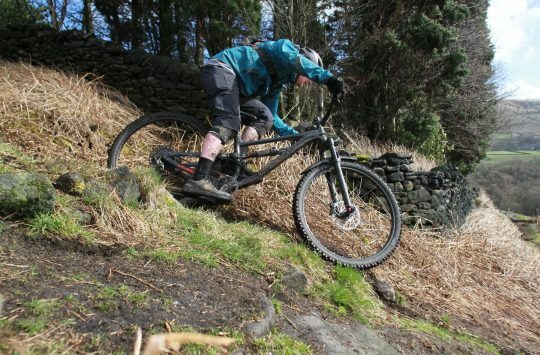 I did appreciate the longer drop though, particularly as the bike encouraged me to get off the back and attempt some pretty technical lines on sight that would otherwise have had me take a second look. 760mm wide Renthal bars, a 50mm Thomson stem and comfortable Fabric Scoop Radius Elite saddle finish off what is a very tidy looking build indeed. Hannah’s parting words to me as I wheeled the ACV away from the Singletrack office, went something along the lines of “test it appropriately…” Now I think she meant that I wasn’t to do anything daft like mark a XC bike down for its inability to rip on a World Cup downhill course or vice versa, but in spite of the tyres (this was the first plus bike I’d seen in the flesh), the ACV+ simply looked like a mountain bike that could travel anywhere. So I promptly ignored Hannah’s advice and rode it everywhere. I rode it uphill, downhill, on rocky bits & muddy bits. I carried it up steep, narrow trails in the Lake District, and I rode it back down the other side. 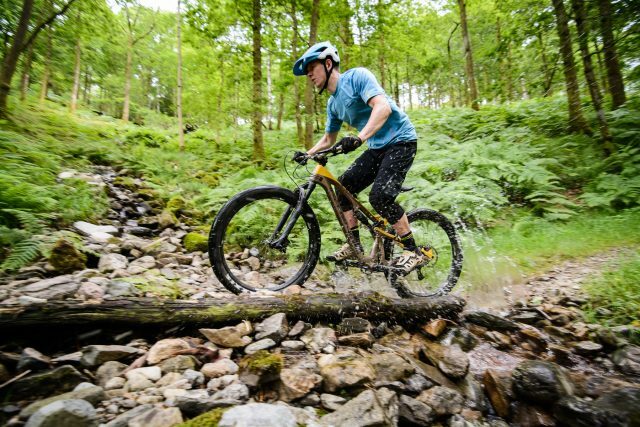 I rode it round trail centres, on natural trails and on steep, off camber, loamy, rooty trails. Uphill, it was grin-inducingly brilliant. With tire pressure around 16-18psi, it monster trucked over pretty much anything I could find and I found myself hunting out impossible looking rock steps and awkward lines, just to see what was possible. Only very rarely would the rear tire spin out, and by this point the gradient was almost vertical and not even a 50T rear cog would have helped. There was also minimal pedal bob coming from the suspension, which meant I hardly had to touch the lockout on the shock (and I felt no need to try to switch to the shorter travel mode). When the trail leveled off, the ACV picked up speed with ease – the 2.8in IKONs iron out a lot of the smaller trail buzz and flatten those mid sized rocks that try to knock you off course or slow you down. The suspension doesn’t wallow either, so in spite of the fatter tyres, the bike is playful and doesn’t feel even the slightest bit sluggish. It’s not all perfect though – the tyres are well suited to dryer conditions and have lots more grip than you’d expect given the smaller knobs, but I lost the front end quite a few times without warning when pushing hard. Whether that’s a symptom of these specific tyres and their lack of any significant side knobs, or plus tyres in general, I can’t say. 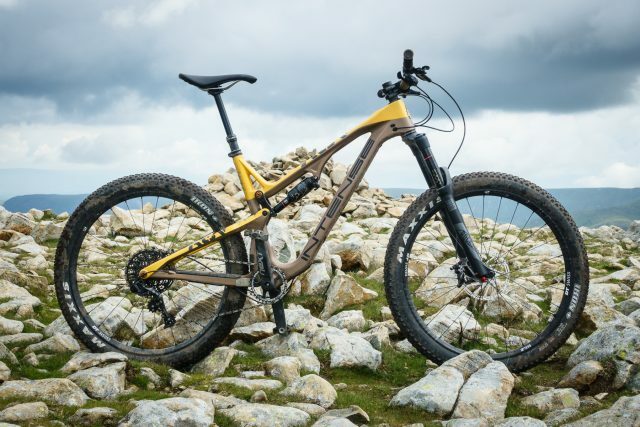 What I do know though, is that the spec is changing on production bikes and they’ll be coming with the more aggressive Maxis REKON tyres which I can’t wait to try out. When pointed downhill and ridden hard, I discovered another problem with the tyres – while the ACV+ encourages you to ride things you wouldn’t normally, the tyres can be vulnerable to pinch punctures. To get the best out of the bike traction wise, you need to run pressures in the mid to low teens (12-15psi), and seeing as these tyres are lighter than the 2.4in ones I run normally, it’s hardly surprising that something has to give. Raising the pressure to 18psi reduces the chance of punctures, but slightly negates the benefits of a plus sized tyre. 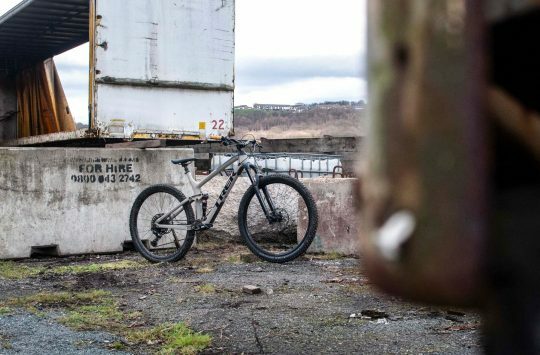 A Catch 22 situation, but one that will hopefully be solved by the introduction of burlier tyres as plus bikes gain traction in the market place. 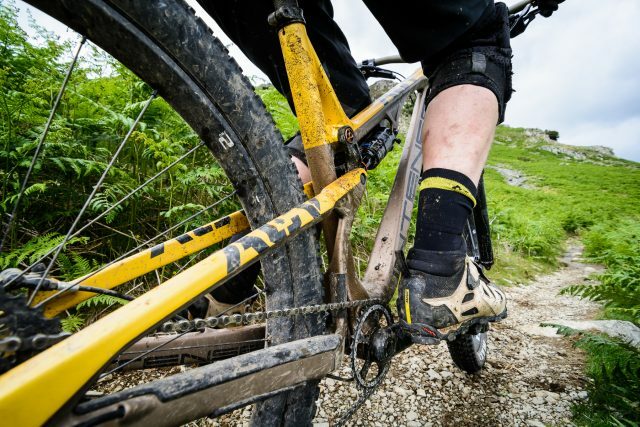 Like most plus sized trail bikes, the Intense ACV+ is a great idea on paper, but one that is held back (at the moment) by a lack of suitable tyres. 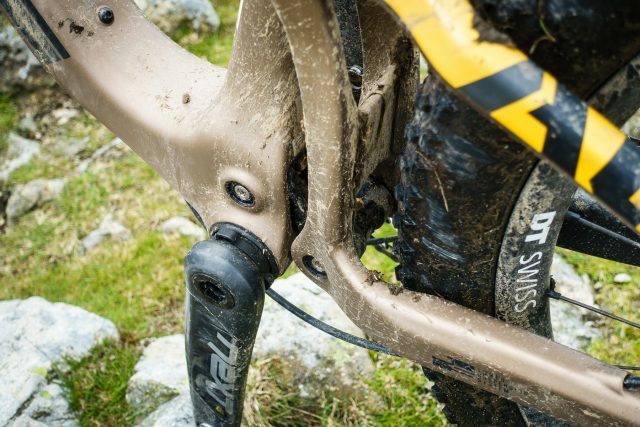 It excels on rough, rocky terrain where it encourages you to have fun, ride quickly and attempt bold new lines, but in doing so makes itself liable for punctures which is a massive shame. As it is, it’s still an absolute hoot to ride, you just need to keep an eye on things when the going gets rough. Just come back from a week in Verbier and my Rekon + tyres were fine. No punctures at all. 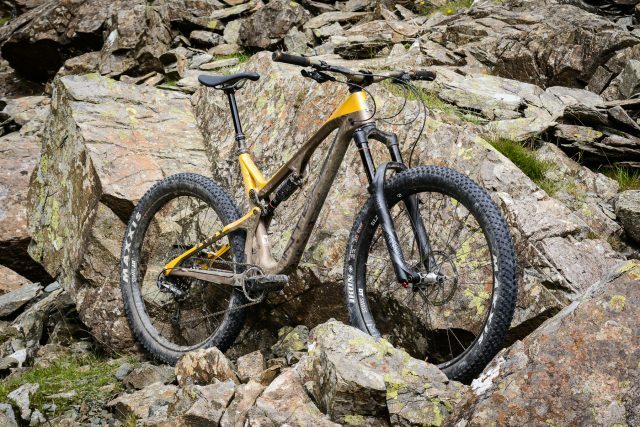 Unlike some of the others in the group on standard 650b and 29ers. 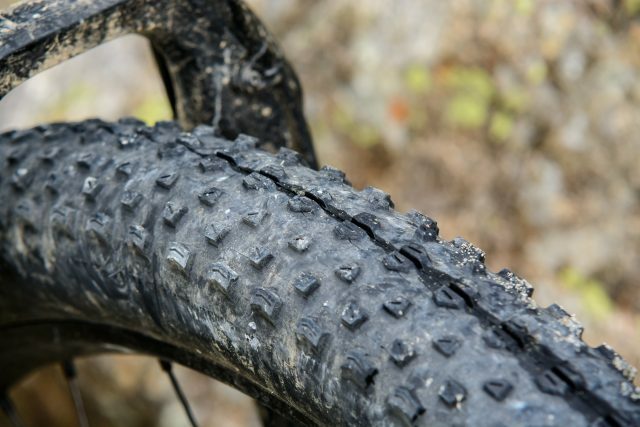 Seems to me like the “+ tyres puncture” is the new “29er wheels explode”. These were the Ikons though, not the Rekon+ tyres. 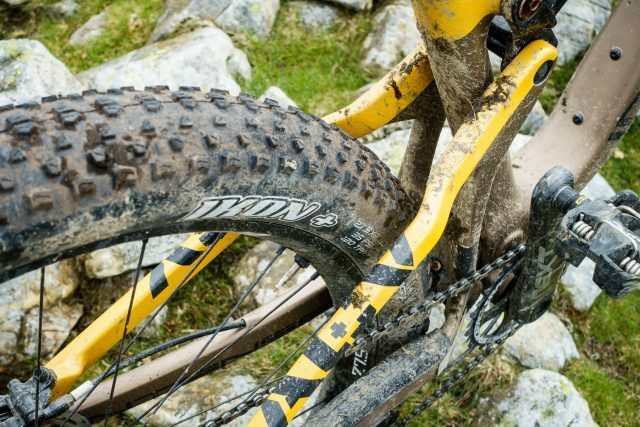 It seems that sub-kilo plus tyres have to sacrifice knobbles or sidewall thickness to meet that weight. I’ve been using 29+ tyres and 50mm rims for the last four years and not had too many problems. From what I’ve learnt you do need to think carefully about tyre pressures to find the sweet spot as 2psi +/- is a big change when you’re running 10-12psi, and you also need to choose your tyres for the season/conditions much like you would with a standard trail bike. There are far more “plus” tyres available now than there were four years ago so this shouldn’t be an issue. 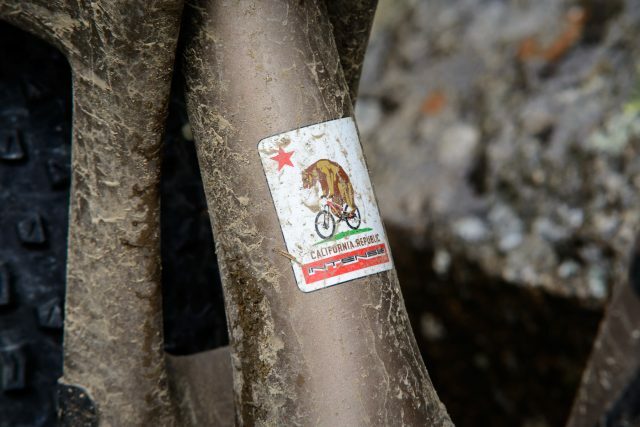 As Chipps said, the Maxxis Ikons will be perfect for California and for UK woodland loamy trails in the summer, but they’re not going to cut it mid-winter in the mud. I think Maxxis are now doing the Minion and High Roller in plus sizes so the choices are looking better.